The keynote speaker that day was the well-known UX and product design consultant Claire Rowland (lead author of the insightful book Designing Connected Products). 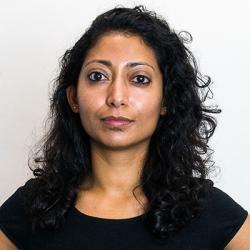 It was an inspiring talk that focused on designing systems of connected products beyond the realm of UI. 1) Is it a product or a service? 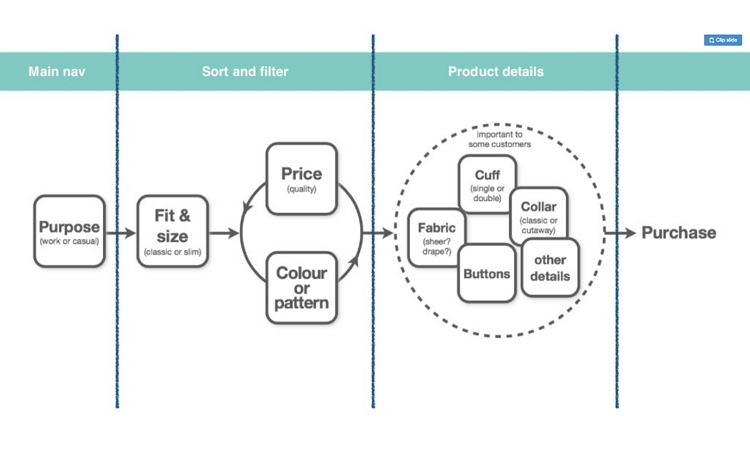 2) How does your product work? 3) How do devices connect? 4) Which code runs where? a. When parts of the system lose connectivity or power, what stops working? b. What are the risks of underestimating support/service costs? 5) How do we design not just for individual UIs but for distributed UX? a. How should the user understand which bit does what? b. What’s appropriate given different form factors and conflicting conventions? 6) How often do devices connect? 7) How do we give users visibility of system functions and privacy? 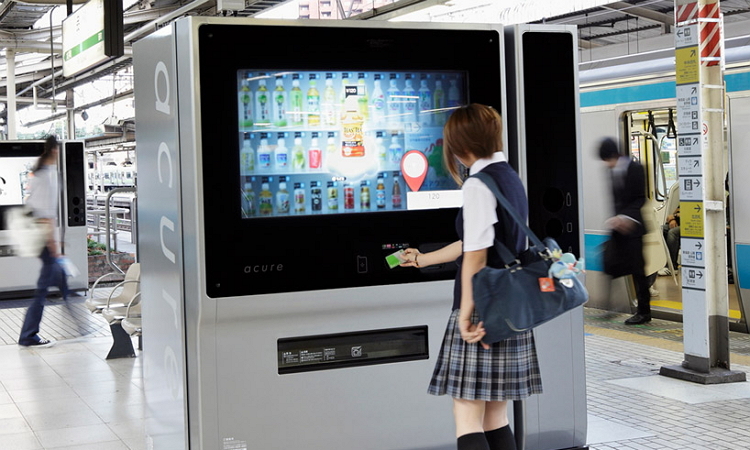 A smart food vending machine in Japan dispenses food and drinks to the public, based on the gender and age of the user in front of the machine. This means women in their 20s get a slightly sweeter beverage. What’s the value in the smart machine over-riding human choice, independence and judgement in this scenario? 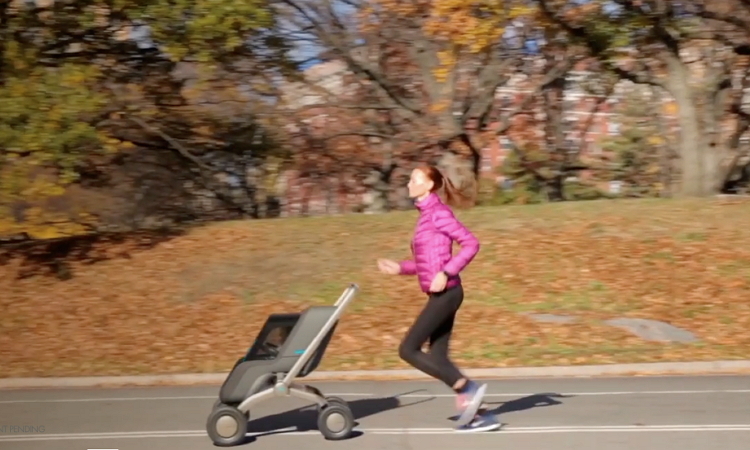 Smartbe, a very expensive self-propelled intelligent buggy that lets a parent jog behind it and synchronises its motion with the parent’s motion is being built with an app to control various features. Some things it doesn’t answer are how it would perform when running downhill, navigating uneven surfaces, potholes, edges, obstacles on pavements such as lamp posts or other pedestrians? Some connected products have the potential to fail in worse ways than the convenience they offer or the products they replace. 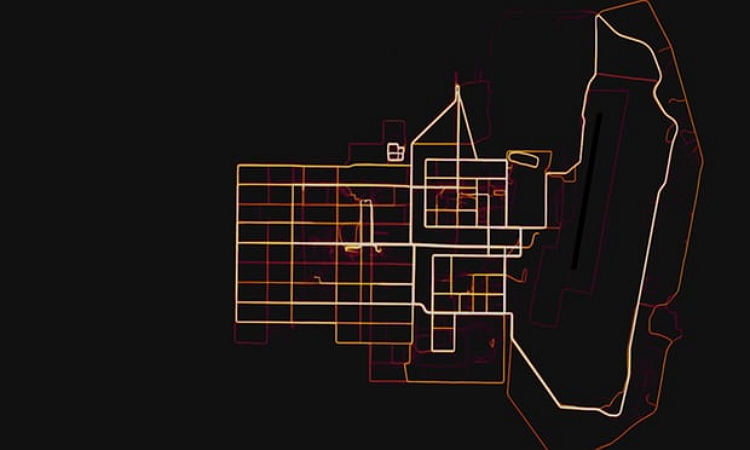 Strava accidentally pinpointed the location and layout of secret military bases where fitness-conscious soldiers had been running around with their fitness trackers or phones. Whoops! 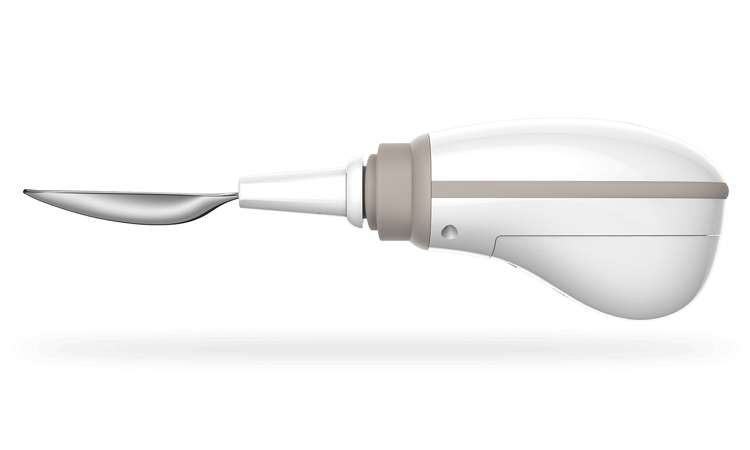 Gyenno, a £210 smart spoon offsets hand tremors (by 85%) for patients with Parkinson’s disease, Multiple Sclerosis and stroke. 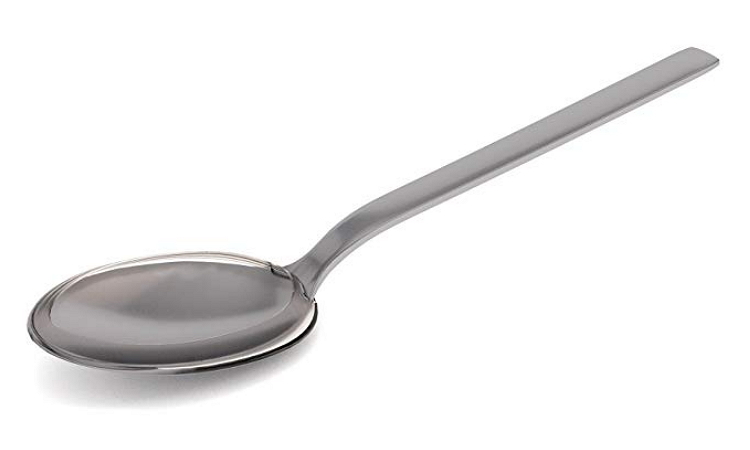 But, this has design problems such as no battery level indicator, the spoon being too small, handle being too large and the connected fork being irreplaceable if it breaks. Put together a diverse team. It takes a diverse team to make an IoT product or service, more diverse than for pure software. No one fully understands everyone else’s jobs, but try to understand their biggest concerns (e.g. saving power, trying to ensure the hardware can support future features that might not be defined yet). Foster communication, so everyone shares what they’re working on and their issues. Involve everyone in the team throughout the process. What looks like a design decision could impact API design or even firmware. UX designer Chris How definitely made this topic interesting and entertaining enough to not forget. 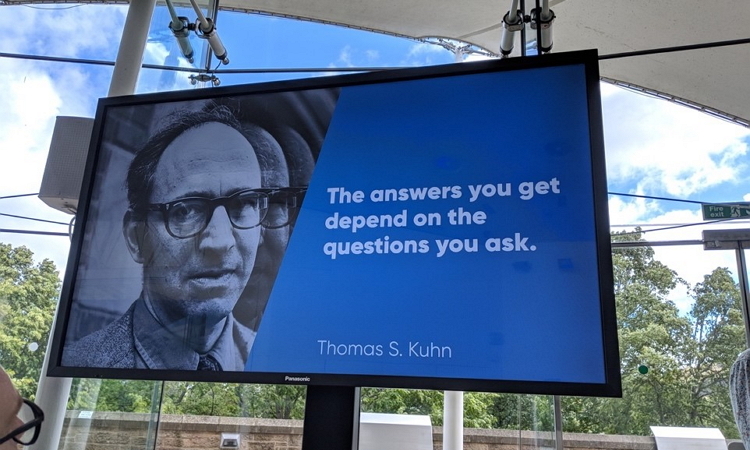 A significant part of a UX designer’s life involves asking questions… more importantly, the right questions. 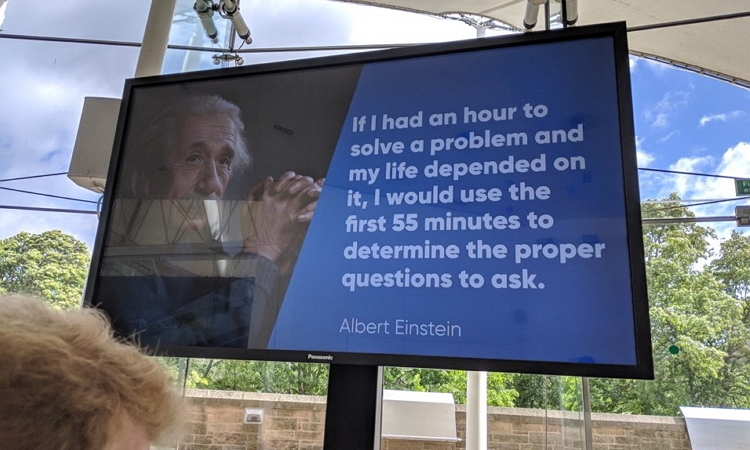 The sort of questions that would give unbiased answers to unlock design ideas. How do I get better answers from my questions? How do I get better at asking questions? 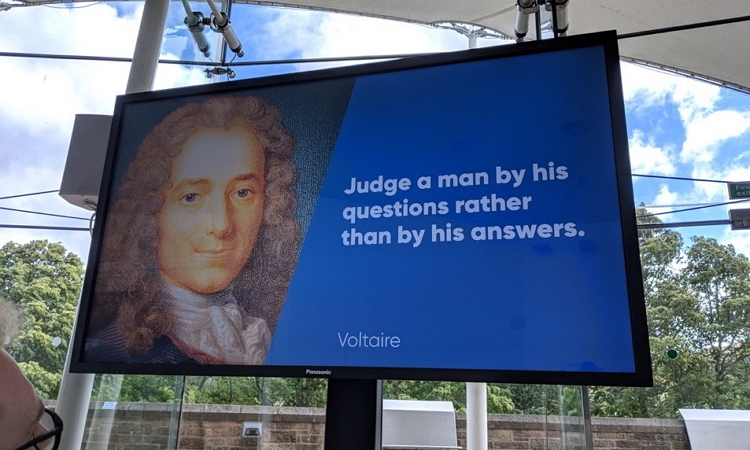 There are eight factors to consider in what makes a good question. 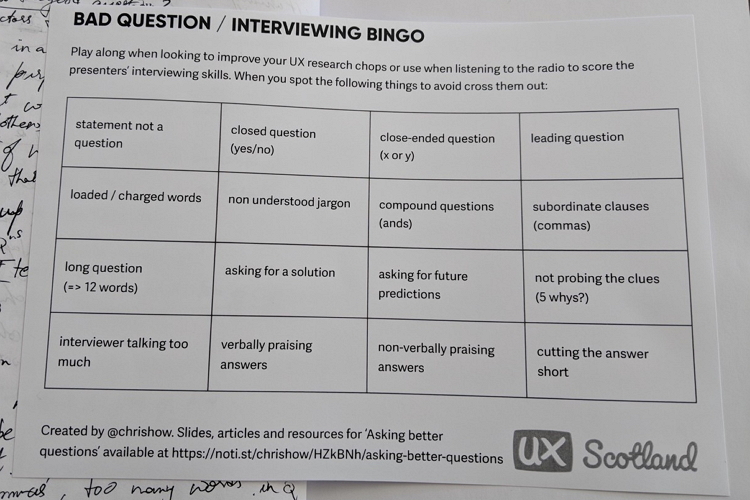 Chris also provided a handy bingo of what to avoid when asking questions! UX expert Jesmond Allen gave an interesting inside peek into task modelling she’s done for some big clients such as the NHS, amongst others. 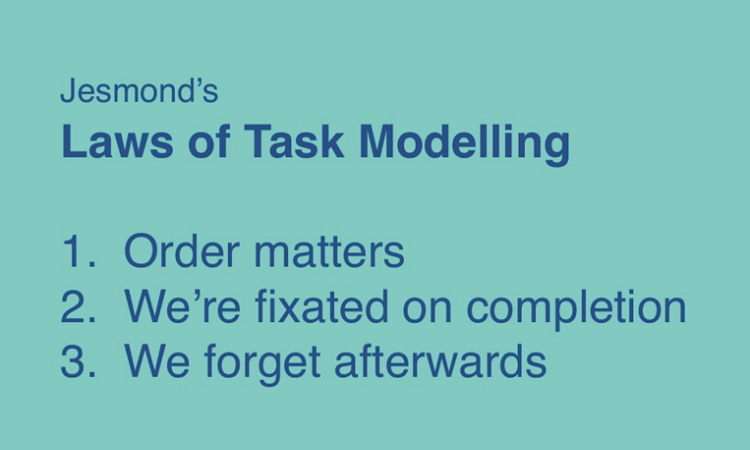 There is a fair bit of psychology applied in task modelling. Our goal is to create designs that enable users to complete their tasks. The Zeigarnik Effect is a psychological phenomenon describing a tendency to remember interrupted or incomplete tasks or events more easily than tasks that have been completed. Incomplete tasks trigger stress. “Incomplete tasks and procrastinating often lead to frequent and unhelpful thought patterns. These thoughts can impact on sleep, trigger anxiety symptoms and further impact on a person’s mental and emotional resources. 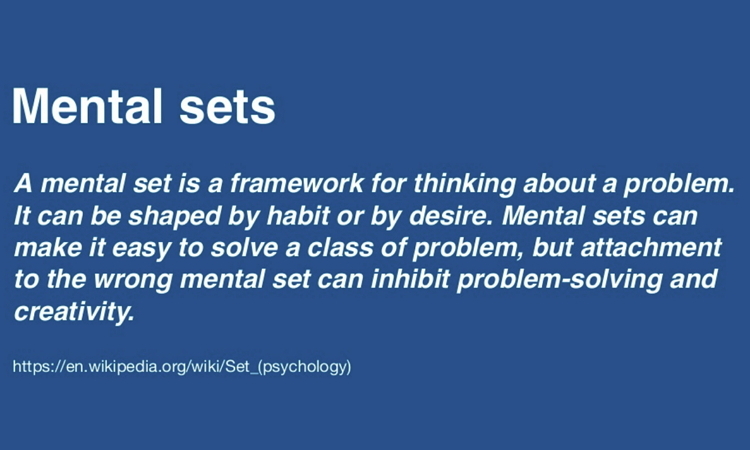 “When used personally or in a therapeutic setting such as cognitive behaviour therapy, the Zeigarnik Effect can promote mental wellbeing by motivating someone to complete tasks, develop healthier habits, set goals and resolve issues that are being postponed. The realm of UX design is ever-changing and expanding. Our experienced team is constantly adapting to the industry, as digital takes more of a precedence in our everyday lives. 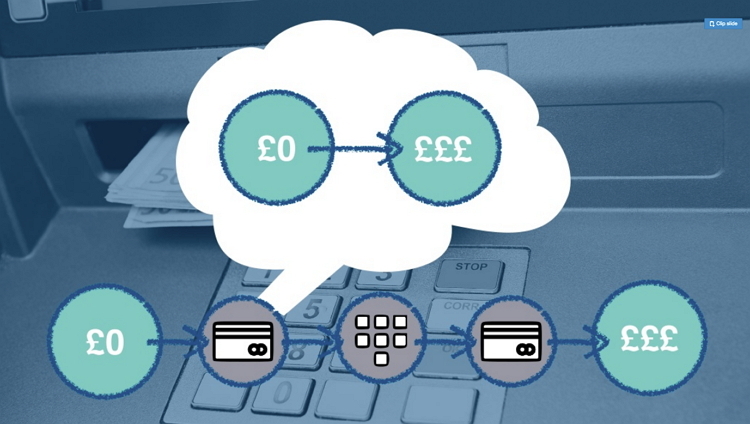 If you would like to discuss how UX can help your business, get in touch with the team today. Mobile Network Accessibility – A Privilege For Smart Phone Users Only?